This is truly an old-fashioned favorite. Easy to grow the lilac came from the Balkan Peninsula in Europe. It is a member of the Olive (Oleaceae) family. The common lilac will award you with an abundance of fragrant spring flowers. It provides fantastic spring color every year without fail. You only need to be near one to smell the fragrance in the air. This deciduous shrubs grows six to twelve feet tall and will get just as wide; so plant them where they will have plenty of room to grow. They will typically bloom in mid-spring and are available in various shades and tints of purple, and as well in white. Their blooms contrast beautifully against their dark green foliage. These shrubs are best planted in full sun and well-drained soil. It may also be planted in the shade, however it will most likely not produce the much wanted blooms. Powdery mildew is known to appear on common lilacs. There are varieties available that are less likely to have this problem. You can also make sure that they are planted in an area with great air flow to help avoid this common disease. They prefer a cold climate and are suited best in Zone 3 to 7. This shrub requires little maintenance. You can literally plant it and ignore it. However, you may want to prun it so that you can reach those wonderful blooms for cutting. Pruning is best done right after the blooms are spent. This will assure you are not cutting off next years production. This is a great addition to your landscape. Since it’s often associated with the first sign of Spring and warm weather. Our feature flower for March is the Crocus. Did you that the Crocus is a relative to the iris? Crocus (disambiguation) is a flowering plant in the iris family. It grows from corms which are actually the storage organ that the plant survives on during the winter, or in adverse weather such as a summer drought. Crocus are a native to the woodlands and meadows. Their colors mimic the spring palette of yellow, pinks, whites and blue to lavender purples. The foliage comes up as a long slender dark green blade, which could be mistaken for grass. It’s also a favored snack of squirrels. There are some ways to help with this problem when you plant or after they are first established. You might try dipping them first in a repellent to discourage the critters, lay chicken wire or Cayenne pepper on the top of the soil to discourage digging in the area. The corms are best planted in the fall in a full sun to partial shade location that has well-drained soil. The depth should be around five inches. They will begin to pop up through the last remnants of ice and snow during the day and will close as evening approaches. This sweet petite fleur sings of spring when you see it popping through the earth. Although we associate it with spring, there is a species known as the autumn crocus that flowers in late summer and early autumn. Mary Ellen Babich sent us some photos for our first Foto Friday in March…Do you have something showing up in your yard you’d like to share? 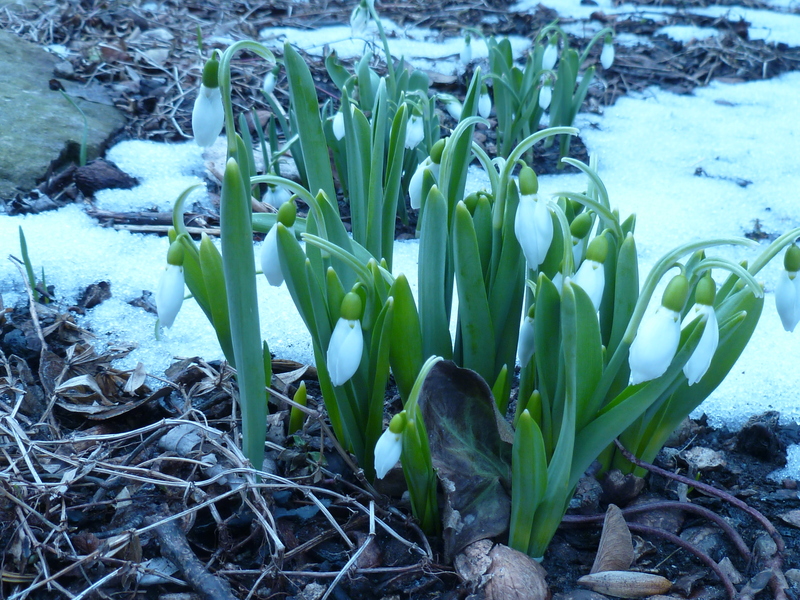 The first flowers of Spring blooming in my garden are hardy bulbs, Galanthus nivalis, the common snowdrop. 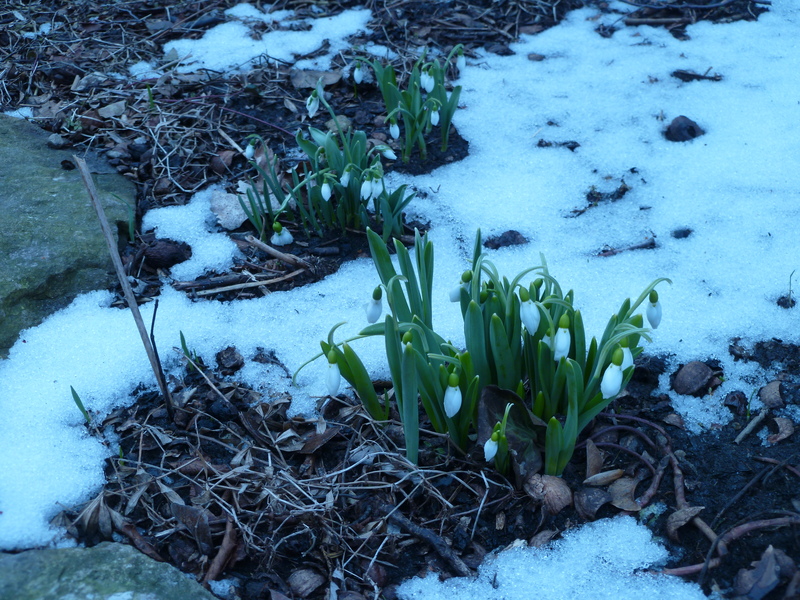 Snowdrops poke through the snow in late February and bloom for a few weeks. They grow in clumps, seldom need thinning, and eventually create drifts as the seeds fall to the ground and take hold. They are perfect for naturalizing.